This is one of the Wizard's most damaging attacks, an orb that explodes on impact for very high damage and a splashing AoE effect. There is also a very high resource cost, with three of these projectiles fired in rapid succession enough to completely drain the Wizard's Arcane Power. It is not a very effective attack against high hit point enemies, but works very well to clear our clusters of normal monsters. The Wizard summons a glowing orb that travels upon touch will deal great damage to all foes and objects in its range. Refer to the Arcane Orb rune effects article for thorough descriptions of all five rune effects in this skill, including screenshots, videos, strategy tips, and other related information. A glowing orb of energy travels about 10 yards, before bursting in a nova of destruction. The spell looks something like the D2 Sorceress' Frozen Orb, but without the spray of ice spears as it flies across the room. It works like the Fireball of Diablo I. This one very quickly became Flux's skill of choice for ranged attacks. It dealt substantial damage with a big AoE splash, and had a reasonable mana cost. He is dubious about the listed 1-2 AoE damage, since a few of these into a group of enemies left no survivors. There was one scenario area in the desert (shown in the gameplay movie) where about five Dune Dervishes burst out of the ground at once. I didn’t think to try it at the time, but in retrospect I wish I could have herded the Dervishes into a cluster, and then tried throwing in some Arcane Orbs. Just to see if my Orbs would have been bounced around like pachinko balls. Arcane Orb was available in the BlizzCon 2010 demo, but wasn't one of the Wizard's starting skills. Skill tiers were removed for the July 2011 Press Event, allowing skills to unlock steadily from levels 1 to 30. Consequently, all skill levels were adjusted and Arcane Orb became a level 8 skill. They do hit with a big boom, and if you get one to the edge of a big pack, it will deal substantial damage. The tricky part about using them (aside from the huge AP cost) is that they are large and move very slowly. This makes it easy to miss. Say you have a big clump of monsters, with several individuals scattered in front. You want the Arcane Orb to hit the big pack, not the solo enemy, but it’s hard not to. In that situation you’d be better off using some other skill, even Magic Missile, to kill the individual before launching your Arcane Orbs into the bigger cluster of targets. With the Beta Patch 8 of December 2011, Arcane Orb was dropped to level 3. With the Patch 13 changes, it was classified as a Secondary skill and moved to level 2. For March's Beta Patch 14, it was bumped up to level 5, and its damage was nerfed quite a bit. See the Wizard skill archive for more details on previous versions of Arcane Orb and other Wizard skills. Or see Arcane Orb (BlizzCon 2008) for the original version of this skill. 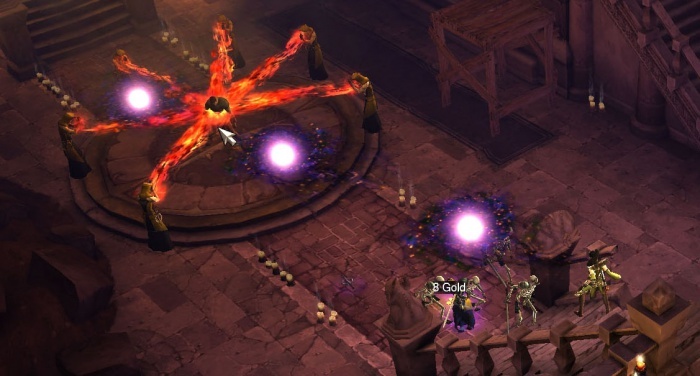 Arcane Orb seems to be a spiritual successor to Diablo II's Sorceress skill Frozen Orb, which also features a slow-moving globe floating across the screen, but includes a spray of ice spears. The maximum range shown thanks to some elevation. 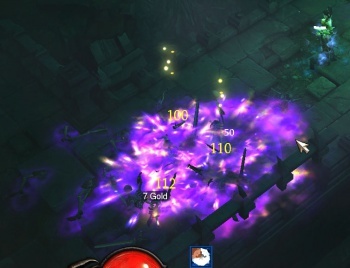 Maximum Arcane Orb range and casting speed demonstration, from the Diablo 3 beta. This page was last edited on 15 April 2015, at 17:25.